ShackTac members create a variety of mods for the Arma series, generally aimed at refining the experience through UI enhancements. This wiki is our new home for presenting information about them. Be aware that our mods are designed for multiplayer usage and you may find issues when switching units or reloading singleplayer saved games. While we’re not against updating them to support such functionality, we’re stretched for time and can’t investigate those issues ourselves. If you’d like to contribute towards singleplayer compatibility fixes for any of the mods that run into such issues, please feel free to do so and submit it to us – naturally, you’ll be credited for any fixes. You can report issues with our mods in the issue tracker, here. STUI requires the latest CBA for Arma, so if you run into issues, ensure you have the correct version of CBA. The A3 thread for it can be found here. When a mod has keybinding options, such as STHUD, you can adjust them from the CBA keybinding menu. If you use the Steam Workshop version of this, CBA is an automatic dependency. Provide situational awareness on where your fireteam members are and what their orientation is. This is intended to represent both peripheral vision, as well as the extended awareness one has in reality. You only see your fireteam members relative to you – no terrain, no other players/units. As long as you are in a group, and not inside of a vehicle, you will see the Fireteam HUD displaying at the bottom-center of your screen. There are three circles – the first one indicates a range of 15m, next is 30m, last is 50m. The current group leader will display as a white icon. If you are not the group leader, you will display as a yellow icon. Other team members will show as green icons. Medics/Corpsmen, automatic riflemen, anti-tank troops, and leaders will show with special icons. When a unit is in a vehicle, their unit role icon will be replaced by a vehicle role icon. This will icon will indicate whether they're a driver, gunner, commander, passenger, or a passenger in a fire-from-vehicle (FFV) seat. Color-coding group members is supported – to use, simply use the in-game team assignment feature – the changes will be made to the HUD after a few moments. The STHUD has a default compass overlaid into it. You can disable this through the fthud_usermenu feature. This compass is tied to your in-game compass item, so if you do not have one, it will not show. When inside of a vehicle yourself, a compass bearing indicating your current view direction will be placed at the top of the STHUD. This is intended as a fail-safe, always-present UI element, allowing vehicle crews to use standardized communication without needing to rely on every vehicle being configured to have the same style of Arma compass. Occlusion is taken into consideration when displaying units on the STHUD. If you do not have a valid line-of-sight on a unit, their marker will begin to fade away, becoming invisible after a few moments. Reestablishing line-of-sight will cause the marker to fade in again. Moving through dense terrain such as heavy woods or jungle thus makes keeping line of sight that much more important. The appearance of someone’s marker, or their name, does not necessarily mean that they are alive. If you move close enough to a dead group unit to see their STNT dead nametag, they'll be automatically removed from your STHUD. When you die, the HUD will automatically close. This has been designed to work with a “Small” or “Very Small” GUI size, so for best results, try it like that. The STHUD currently supports a max of twelve names displayed. Longer names will be truncated to prevent multi-line usage. In previous iterations, the UserMenu allowed you to change a few different things from the UI directly. However, the UserMenu's only purpose in the current version is for resetting the HUD. The menu is brought up by pressing alt-shift-H in-game. For some of the other options that were allowed in previous versions of the UserMenu, see the customization through CBA Settings section. 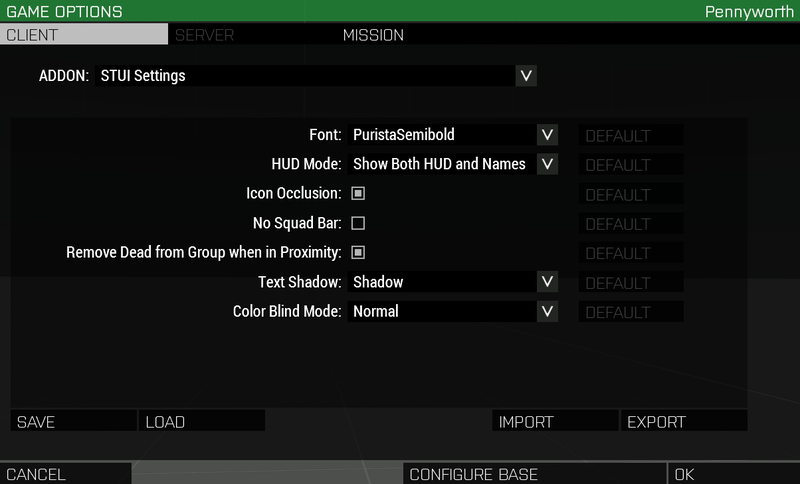 To enable our hidden squad bar mode, set the bool STHud_NoSquadBarMode to true in a mission or mission framework. Alternatively, you can toggle this setting from the corresponding field in the CBA Settings menu. When in this mode, the HUD will now indicate unit selections by a > in front of the name, as you see in this image. When you select any unit, you will see numbers next to the names that correspond to the F-key required to select the unit. This is needed for situations where group members change in a fashion that alters what number they are, versus what number they are in the list. Note that this does not support more than 12 members in a group currently. If that's important to you, keep the squad bar enabled. STGI is designed to take the existing vanilla group icon concept and flesh it out into something more usable – instead of being a perfect representation of team members at any distance, we’ve made it a more interesting package that helps to preserve functionality while increasing depth. Group member coloring. As with STHUD, group colors will be reflected in the color of the group indicator. This helps to allow for easier buddy-team usage and less of a need to look at STHUD to determine that information. Transparency. STGI icons are less visible than the default ones and will fade to half of their normal brightness when night falls. This makes them viable for identification, but not distracting or intrusive. Distance fade. STGI icons will begin to fade out starting at 30m, becoming completely invisible at 60m range. This makes them useful for close-range coordination and identification, emphasizing team cohesion while making for more interesting identify friend/foe situations when people fall behind or get split up. Removal of the “stay in formation” indicator. This is a little caret that was intended to let you know where the AI expected you to be in a given formation – as it’s not relevant for player usage, it’s been removed. Occlusion system. When you don't have line of sight on a unit, their group indicator will not be visible. The ShackTac Name Tags system – STNT – was designed to replace the existing Arma nametags in order to make them more usable and interesting. This is intended to be used alongside ShackTac HUD and the ShackTac Group Indicators. STNT tags show two pieces of information – the player’s name and his group name, with the player’s name being slightly larger for clarity. The display of the group name is intended to give easy at-a-glance “What unit is this?” identification. The tags will fade over distance, with the name being visible for twice as far as the group. The furthest you’ll see a name tag at is 40 meters, and this distance changes based on the lighting conditions. You’ll see the tags at shorter distances during dusk or dawn, and at much shorter ranges at night. If you have nightvision on, you’ll be able to see the tags better at night than otherwise, but still not at daytime distances. If group colors are being used within a group, each member of the group will see people’s names displayed in the appropriate colors. This only happens within your own group – all other players will display with green names. The group tags will be colored white for units within your own group, and pale green for people in other groups. Tags will appear instantly when moused over a player, but will fade away when you mouse away from them. Living enemies will never display name tags – only people on your own side will do so. If you move within range to see the dead name tag of a group member, they'll be automatically removed from the STHUD group. The ShackTac Stamina Bar is a mod created to help give a subtle visualization of your current stamina level. This has no prerequisites. This is a very simple way to maintain awareness of your stamina state. In reality it’s very easy to tell how tired you are, how long it will take to recover, etc – whereas in a game, having breathing or screen-dimming effects doesn’t convey the same detail of information. One of the concerns about any sort of stamina representation is that it could clutter the UI, and because of that, I’ve gone to extra effort to ensure this is a very subtle visualization. The stamina bar appears in the lower-left of the screen, mostly translucent at the start. As fatigue increases, the bar becomes more visible and begins to fill up, changing color smoothly from green to red as you accumulate stamina. The stamina bar is disabled if driver, gunner, or commander of a vehicle. Passengers will still see their stamina. This is intended to allow an embarked infantryman to know how their stamina is recovering while in a vehicle, whereas it’s assumed that the driver, gunner, and commander are staying in their vehicle and don’t need to know that info. The stamina bar will disappear once the camera perspective and the player model are sufficiently far apart (~5 meters). This makes it usable in third-person, but if you go into a camera mode or similar, it will disappear in order to allow for easy cinematic shots without the UI element being there. Thanks to Taosenai for feedback and ideas to help further refine this. Note that this is intended to be used without the Nexus stamina bar. You can now customize a variety of settings directly from the CBA Settings menu. CBA Settings allow for easy configuration of the STUI for only your client, the server as a whole, or just for a specific mission. This system also has the benefit of allowing you as a server admin, or mission creator, to force settings being synced across all clients. For further information on how to force and sync settings across a mission, or server, see the server and mission settings portion on the CBA wiki. There are nine fonts available to chose from. The default font is "PuristaSemiBold". Icon occlusion can be enabled or disabled by checking the corresponding box. By default, it's enabled. No Squad Bar can be enabled or disabled by checking the corresponding box. By default No Squad Bar is disabled, meaning the squad bar is visible. See the Squad Bar Hiding section for more information. The feature of removing dead units from your group after you look at them from a short distance can be enabled or disabled by checking the corresponding box. By default, it's enabled. There are nine color blind modes available. The default mode is "Normal". Thanks to Kingsley for the SQF implementation. If you would like to use STUI without the occlusion features, simply set STUI_Occlusion to false in your mission/framework. You can also disable occlusion from the Icon Occlusion CBA Setting. STUI_RemoveDeadViaProximity controls removal of dead via proximity checks - set it to false if you'd rather not use this feature. Alternatively, this feature can be controlled by the Remove Dead from Group when in Proximity CBA Setting. ShackTac Map Gestures is a standalone mod and requires the entire server to use it for proper functionality. After adopting this mod, ShackTac saw a significant increase in briefing clarity and efficiency. It became significantly easier for a leader to talk through a plan and show exactly what the intent was via gestures, and anyone with questions could easily ask them and show exactly what they meant on the map via the gestures. Map gestures are enabled automatically a few seconds into a mission. To use, simply click and drag on the map to activate – as long as you hold down your left mouse button after dragging, your point will continue to display. Map gestures are visible to others within a 7-meter radius and are tagged with a subdued name to the left of your pointing dot. Map gestures are visible within a vehicle, but not between vehicles or between dismounted and mounted units. Group leaders will have brighter pointers, while subordinate members will have slightly dimmer ones, to help differentiate more easily between pointers. In the past, sending updates through the server was a bandwidth concern and could potentially cause performance issues – fortunately, A3 has introduced new methods, and STMG solves this problem by using a client-to-client transfer method that avoids the server entirely. Instead of going through the server, clients send their “map gesture” data directly to other clients within a short range of them. This mod is designed to be used in an all-or-nothing fashion, which is to say, as part of a core modset and not as an optional aspect. All clients and the server must have it. Using it in any other fashion will likely cause issues, as well as defeat the purpose of it (why gesture if you don’t know if someone can receive it?). This mod uses a unique server key, not tied to the existing STUI key, making it something that must be deliberately allowed on a server. This concept was donated to and adapted into ACE3, so if you're using that, you don't need this version. Usage of ShackTac mods, including STUI, requires agreement with the following terms. They may NOT be modified, included in other mods in whole or part, used for military training or any commercial purposes whatsoever, without prior permission from the authors. Redistribution of the addon via community repos etc is permitted only if it is unmodified and free of charge. You may choose to only include specific addons in your repo, but may not modify the actual PBOs themselves. Modifications are forbidden without prior permission from the authors.